Robert Bunsen discovered the antidote to arsenic poisoning. Years later, it saved his life. He invented the zinc-carbon battery; invented flash photography; showed how geysers function; and with Gustav Kirchhoff invented one of the most fruitful scientific methods in history: spectroscopy, which Bunsen and Kirchhoff used to discover the elements cesium and rubidium. His name is best remembered for his invention of the clean-burning Bunsen burners used in laboratories worldwide. Robert Wilhelm Eberhard Bunsen was born on March 30, 1811, in Göttingen, Germany. He was the youngest of four sons. His father was Christian Bunsen, professor of modern languages and head librarian at the University of Göttingen. His mother came from a military family. Bunsen once recalled that he had been a wayward child at times, but his mother kept him in line. He attended elementary school and high school in Göttingen. When he reached the age of 15 he moved to the grammar school in Holzminden, about 40 miles (60 km) from Göttingen. In 1828, aged 17, he started work for his degree at the University of Göttingen. He took courses in chemistry, physics, and mathematics, with some geology and botany. He won an award for his work on a humidity meter. When he wrote this work up in 1830, he was awarded a Ph.D. in chemistry – he was just 19 years old. Bunsen stayed at Göttingen until he won a government scholarship to travel around Europe studying chemistry. He spend most of 1832 and 1833 learning chemical techniques in laboratories in Germany, Austria, Switzerland, and France. In France he spent time in Paris working with the famous chemist Joseph Gay-Lussac. In 1833, aged 22, Bunsen started working as a chemistry lecturer at the University of Göttingen. He had obtained his license to teach, but received no salary from the university. He tutored students and carried out research in the chemistry laboratories. In the early years of his career, Bunsen researched arsenic compounds – hazardous work. In 1834 he published his first important work. Working with the physician Arnold Berthold he discovered an antidote to arsenic poisoning. He found that adding iron oxide hydrate to a solution in which arsenic compounds are dissolved causes the arsenic compounds to fall out of the solution as ferrous arsenate, which is an insoluble, harmless solid. Bunsen developed an ongoing passion for studying the compounds of arsenic. Like the good chemist he was, he tried to take precautions against the toxic effects of these compounds: he devised a face mask with a breathing tube that fed him clean air from outdoors while he worked. Some arsenic compounds, however, are explosive. Without warning, they explode in dry air. In 1843, nine years after finding the antidote to arsenic poisoning, Bunsen became a victim of such an explosion when a sample of an arsenic compound called cacodyl cyanide exploded, shattering his face mask and permanently blinding his right eye. The explosion also resulted in Bunsen suffering severe arsenic poisoning. He was saved from death by the iron oxide hydrate antidote he discovered nine years earlier. In 1841 Bunsen invented the zinc-carbon cell – often called the Bunsen battery. He saw this as an improvement on the expensive Grove cell, which was used, for example, to power telegraph lines. The Grove cell was a zinc-platinum cell. The platinum in it made it very expensive. Bunsen combined his zinc-carbon cells into large batteries, which he used to isolate metals from their ores. He was the first person to produce large scale samples of pure magnesium metal. His replacement of expensive platinum with cheap carbon also allowed other researchers who had been deterred by costs to carry out work in electrochemistry. Bunsen developed new techniques to analyze gases. Between 1838 and 1846 he used his methods to study gases produced by industries. He found that in the steel industry, where heat was produced by burning charcoal, much of the charcoal was not burning completely. It was burning to form carbon monoxide, rather than producing much more heat by burning efficiently to form carbon dioxide. To improve efficiency, Bunsen recommended the exhaust gases from burning charcoal, full of carbon monoxide, should be recycled to generate more energy by burning them to form carbon dioxide. He estimated German furnaces were wasting 50 percent of their energy and British furnaces 80 percent. Eventually, the reluctant industries changed their ways and adopted Bunsen’s recommendations. Bunsen was interested in both gas analysis and geology. He was invited to Iceland in 1846 to study volcanic activity, where he made fundamental contributions to geochemistry. By bravely standing at the sides of geysers and lowering scientific apparatus into their depths, he discovered that geysers have at their base a reservoir of superheated water: this water is much hotter than 100 °C. It is kept liquid by high pressure below ground. As this water rises from below, the pressure falls, and the water boils explosively to form a geyser. Chemists and alchemists before them were aware that if you sprinkled a sample of a substance into a flame, the color you saw helped you identify chemical elements in the sample. Lithium compounds, for example, burn with a rose-red flame, while potassium compounds burn with a lilac flame. This is seen in the chemistry of fireworks, where different colors are produced using salts of different elements. Bunsen observed that sodium compounds gave an orange-yellow flame. However, the fundamental color of the flame itself, before chemicals were sprinkled into it, could interfere with the test, making it unreliable. Bunsen’s response was his gas burner. 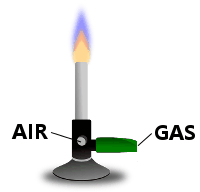 By introducing air into the gas in the correct proportion before it burns, a clean, soot-free, almost colorless flame is produced. Using his burner, Bunsen used flame tests to analyze substances much more reliably than ever before. The burners he designed were made by Peter Desaga, his laboratory assistant. Bunsen published the design of the burner in 1857, but did not patent his design. He did not wish to make profits from science; he believed the intellectual rewards were more than enough. His burner is now used not only for flame tests. It is used to heat samples and to sterilize equipment in medical laboratories all over the world. Bunsen’s friend and colleague Gustav Kirchhoff was interested in the infant science of spectroscopy. 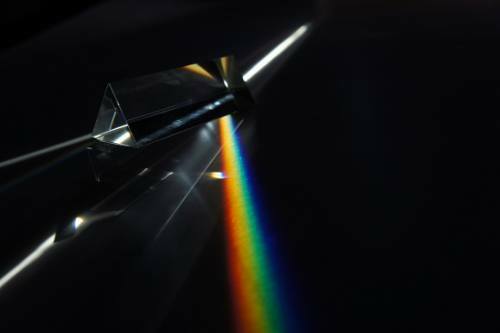 Spectroscopy was the science of splitting sunlight into the colors of the rainbow using a prism – much as Isaac Newton did in 1666. A prism splits a beam of sunlight into a colored spectrum of light. Many years later, in 1802, William Hyde Wollaston repeated Newton’s experiment, but looked at the spectrum of sunlight using a magnifying glass. He saw more than the colors of the rainbow: he saw seven dark lines within the colors. Fraunhofer could not explain the lines. 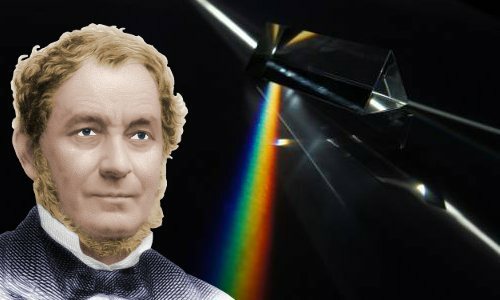 Fraunhofer saw dark lines when he magnified the spectrum of sunlight from a prism. Bunsen had first met Kirchhoff and worked with him at the University of Breslau, when he spent a year there in 1851. In 1852, Bunsen took the Chair of Chemistry at Heidelberg University. In 1854, he arranged that his friend Kirchhoff should follow him, to take the Chair of Physics. The pair then formed a highly productive research partnership. Kirchhoff was interested in the new science of spectroscopy. He wanted to explain the dark lines in the sun’s spectrum. He made the historic discovery that they were caused by cooler gases in the sun’s atmosphere absorbing particular wavelengths of sunlight. These dark-lined spectra are now called absorption spectra. 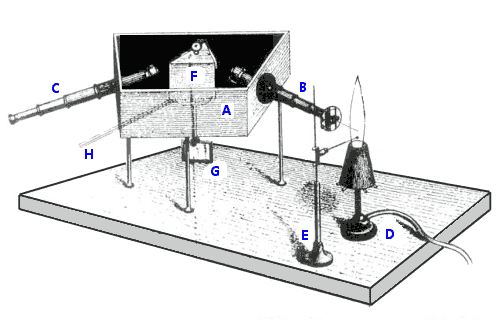 In 1859, Kirchhoff and Bunsen brought together a spectroscope and a Bunsen burner to study spectra from Bunsen’s flame tests. The two scientists looked at the spectra of a variety of different substances in the hot flame of the Bunsen burner. The results were stunning. Bright lines appeared in the spectrum: the elements, when strongly heated in the Bunsen burner’s flame, emitted light at particular colors or wavelengths. These bright-lined spectra are now called emission spectra. Lines in the spectrum turned out to be a reliable ‘fingerprint’ for chemical elements. Every element absorbs or emits characteristic wavelengths of light, leading to different ‘fingerprints’ of lines for the different elements. A new science had been born – chemical spectroscopy. Using their newly invented method, Bunsen and Kirchhoff discovered two new elements: cesium in 1860, and rubidium in 1861. The beauty of spectroscopy is that tiny traces of a substance can be detected. This opened up a whole new field of chemical analysis where elements could be detected when their concentrations were exceptionally low. For example, Bunsen and Kirchhoff’s spectroscope revealed the new element cesium, even though there was only a tiny amount of cesium in the mineral water it was discovered in. In fact, when Bunsen tried to get a sample of the new element, he had to process 40 tons of mineral water to extract 50 grams of cesium salt from it. After Bunsen and Kirchhoff published their work, other scientists quickly realized the power of the new technology. This led to the discovery of more elements, including indium (1863), helium (1868), europium (1896), gallium (1875), and hafnium (1922). Kirchhoff identified some of the elements present in the sun. Other scientists looked to the stars and discovered they are made of exactly the same elements as we find in our sun and on our earth. Today, spectroscopy encompasses all wavelengths of the electromagnetic spectrum, not just visible light. It is an enormously valuable method for solving a huge variety of scientific problems. Even living things can be analyzed with spectroscopy, such as when magnetic resonance spectroscopy is used to identify diseases in people. In 1864, Bunsen and his research student Henry Enfield Roscoe invented flash photography when they used the intense, bright light from burning magnesium as a light source to allow photographs to be taken in poor ambient light. Bunsen never married and had no children. He had a reputation as a fun person to be around, full of laughter, but not too careful about his personal appearance – he had better uses for his time than wasting it over selecting clothes and looking at himself in the mirror. Another professor’s wife once said that she would like to kiss him, but she would have to wash him first! He had a great reputation for warmheartedness, and enjoying jokes and fun. His students admired him greatly. He told a great many anecdotes, published after his death in a short book called Bunseniana. One of Bunsen’s favorite activities was walking in the woodland and hills around Heidelberg – here he got time to think. On these walks, he said, his best ideas would come to him. Bunsen did a great deal of his laboratory work personally. He was a skilled glass blower, and he preferred doing experiments to anything else in science. Bunsen worked in pre-Nobel prize days. In 1860 he was awarded the equivalent of the Nobel Prize, in the form of the British Royal Society’s Copley Medal; he also won the Royal Society’s Davy Medal in 1877. He was elected foreign member of the Royal Society, and in 1883 became one of eight foreign members of the French Academy of Sciences. Robert Bunsen died aged 88 on August 16, 1899 in Heidelberg. Images of Robert Bunsen enhanced and colorized by this website. "Robert Bunsen." Famous Scientists. famousscientists.org. 23 Sep. 2014. Web.